Learn to make this convertible Gem Star Ring. 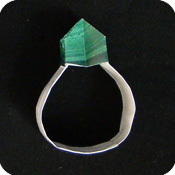 You can make it look like a square-rock gem type of ring, or as a cut-star type of ring. 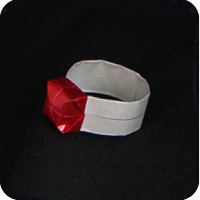 The ring looks really nice when folded with foil paper . Regular origami paper works well too; the white back-side gives a white band and the colored front-side of the paper will be the color of the star gem. 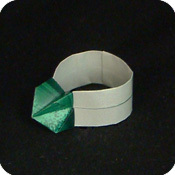 You can even make finger rings out of US dollar bills! Start with a rectangular sheet of paper of size 1 inch x 4 inch. Fold in half lengthwise. Unfold. 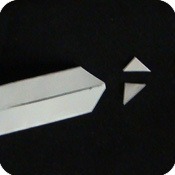 Fold in the two corners as shown. in between the top and bottom layers of papers). Fold the top-edge and bottom-edge of the paper towards the middle. Fold the top section towards the left. Mountain fold (fold back) so the right-side is behind the left-side. Open the two sides so the star gem is pointing up. Pull the two ends away from each other to ease open the center. Shape the central gem by either pushing down the point so it is flatten into a square. Or, pinch the sides so it looks like a star (or the tip of a Phillips screwdriver). Loop the ends together and tuck one end into the other. Hint: you can trim one end so it is easier to slide into the other end. 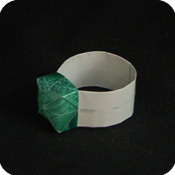 Origami paper rings are fun to make and fun to wear. They are not as serious as a real diamond ring, so it’s a nice way to show you care without the severity of a real diamond ring. 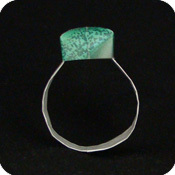 Friends can give friendship rings or club rings.